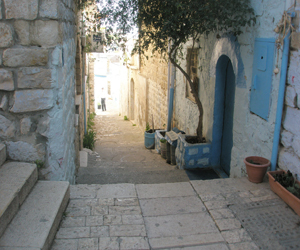 Location: Sarah’s Vacation Tzimmer is located in the heart of the old city across from the Sanz shul where there is always a minyan. One minute from Kikar Meginem and Rechov Yerushaliam (main street). Our tzimmer is in the best location for the ultimate Tzfat experience, minutes away from the art galleries, synagogues, historical sites and restaurants. The Tzimmer: Our tzimmer can sleep six comfortably, and there’s room for more mattresses. There are three bedrooms. There are two full bathrooms, including one in the master bedroom. The tzimmer has a large, luxurious kosher kitchen with a family-sized refrigerator, oven and stove. We also offer a full Shabbos set up with a hot plate, hot water urn and a crock pot if needed. The salon is spacious, large, and airy. There is a large beautiful dining room table that fits large families. Sarah’s Tzimmer is beautiful and elegant but at the same time inviting and kid friendly. To ensure your comfort, Sarahs Tzimmer has air conditioning/heating , washing machine, and optional internet. Atmosphere: There are large windows and a great cross breeze filling the tzimmer with fresh Tzfat air. The tzimmer has two porches. There is a large porch overlooking the old city of Tzfat , Meron and Tiberias. The porch is the perfect place to eat dinner on a breezy summer night and to unwind with the view of a magnificent sunset.